Based in California Porterville, Ennis Homes is a home remodeling experts with its line of business being that of a developer/ subdivider and it is one of the United States top 200 home builders and it has been in operation for nearly eleven decades. It is a full services home builder and remodeling company with its mission being t provides quality home building and home remodeling services. Ennis Homes also deals in home improvement which includes bathroom remodeling, renovation of kitchens and even windows installation and replacement. Among the active officers of the Ennis Home Corporation is Brian G. Ennis, the current CEO. 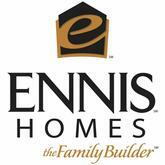 There are currently 0 consumer reviews about Ennis Homes available. Share your review. Please take a note that you are about to post a public review about Ennis Homes corporate office on CorporateOffice.com. This review will be public, so please do not post any of your personal information on this website. If you would like to contact the corporate offices of Ennis Homes, please use their contact information such as their phone number, website, and address listed above to contact them. However, sometimes staff from Ennis Homes headquarters do read the reviews on this website.